This is a great place! Lots of room, nice dishes, great furniture, especially the beds! Will definitely be back! We really enjoyed our stay. The condo was very clean, and nicely decorated. I spent most of my time sitting on the balcony watching the waves and people walking on the beach. Even though it was January, it was just sort of cool, not cold. Jacket was perfect. Only problem we had was my husband was sick and we had to leave a day early. Definitely hope we get to come back and stay again. The house is very clean and well-equipped. A couple of minor issues were repaired very quickly. The beach is pristine and not crowded at all. We highly recommend this home. Loved the apartment. Well decorated and great amenities. This is a beautiful and well equipped unit. Views are spectacular. Beds were the most comfortable Ive slept on in any rental and mattresses appeared brand new. Great location and plenty of room in the unit for us to have our own bedroom and bathroom. Highly recommend! Condo was very clean, lots of amenities, great view and very relaxing. Any question was answered promptly and to our satisfaction. Would recommend this condo and would stay again. We really enjoyed our first trip to Orange Beach. Despite the cooler weather, we still enjoyed walks on the beach. The condo was just right for our needs, and our dog. This was a great condo on the beach. It was as nice as advertised through the VRBO site and perfect for 4 couples. We enjoyed our long weekend and would definitely come back and stay in this unit again. We had a good time, everything is close, short walk to the beach. Perfect! The property was very clean, beautifully decorated. We had 4 adults and 3 children in this condo and we never felt crowded. It was very spacious. My favorite part was the balcony. It has an AMAZING view. I also liked how there was several beach toys for kids to enjoy and play with on th ebeach. And we cant forget the hot tub and pool! Those were nice too! Overall, my family enjoyed our stay, no complaints, and are already looking forward to staying here again. This place and renting experience was truly beyond our expectations. We had an awesome family vacation! My brother-in-law was staying at Phoenix West 2 for a month. He invited us down for a few days but he was on the 27th floor and my husband does not do heights. I found 508 and the price was great. We have stayed in a lot of beautiful condos over the years but this by far was the best. My husband and I were down looking at condos with our realtor to purchase for ourselves. But after seeing this condo all we looked at paled in comparison. But these units were a bit out of our price range. Beds were so comfortable. Slept wonderfully while we were there. No complaints about anything. One thing for anyone staying there unless you use a Keurig coffee maker the other coffee maker uses a cone filter. Every condo I have ever stayed in used regular filters except this one. It took a cone filter (which is what we use at home). But no biggie. Kitchen was stocked with quality dishes etc. Everything you needed. No problems with the door code. One of the best experiences we have had. Special thanks to Murray and Elizabeth Moss for stopping in with a welcome packet and introducing themselves. Although we didn't need anything during our stay I know if we did need something it would have been taken care of right away. Great!!!!!!!!!!!!!!!!!!!!!!! This condo was beautifully decorated and was very clean. The kitchen is supplied with everything we needed, plent of dishes, cookware and utensils. Very well located and within walking distance to groceries,shopping and eating We would reccomend this place and will definitely come back. I am so glad I booked this unit. VERY nice and we enjoyed the stay! We have ZERO complaints about the room and the property management company was great. Loved Turquoise Place and the amenities. Great location, beautiful beach! I am very likely to book this unit again. Loved this condo. They provided everything you would need other than beach towels, which we expected and brought our own. We loved the patio and having plenty of chairs there to enjoy sitting outside when it wasn't warm enough for the beach. The furniture was comfortable as well as all of the beds. Loved this place and will definitely be back! The indoor pool and hot tub was nice. It could use a bit more ventilation! The elevators were fast and location is great. Many restaurants are close. Walking distance for us. Anyone we came in contact with was very friendly and helpful. I would recommend this to anyone!! The pictures are exactly what it looks like. Good supply of basic items to get your visit off to a great start. Beds were very comfortable. Kitchen was well stocked with just about anything you would need. Alabama Getaway staff was very responsive and stopped by to welcome us which was great as the television was a little challenging technologically for me. Negatives- had difficulty with the thermostat/ my husbands circulatory system is compromised and we couldnt figure out how to get it warm enough for him. Should have contacted AG staff but didnt, ended up just turning it off. 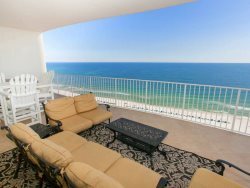 This condo is not right on the beach and is a little bit of a walk to get to the beach. Exhaust fan for the range is pretty loud. Would definitely stay again and recommend this unit. WOW! What can I say. This 3 bedroom 4 bathroom condo on the beach with a great ocean view met all our expectations and went way beyond. The condo is spacious and nicely furnished. When I saw the pictures of the unit before before our trip I wondered could it really be that great? It was. Our family had a great stay and would return again. I think yours would too. Great location, price and unit. Beautiful view. Two thumbs up. I was in town for work and decided to extend my stay through the weekend. The rental agent answered my questions after hours and the condo was ready for use by check-in the next day. The condo was clean and very comfortable. The curtains were missing from the main living space, but that meant we got to enjoy the view even more! My children enjoyed the indoor pool and walking on the empty beach :) This unit is located very close to The Hangout and is next door to Sea n' Suds. It was very convenient to everything else we wanted to do over the weekend. We will definitely be looking into a summer stay in this unit again! Good location. Condo was as presented. Everything worked fine. We hope to return. Everything was positive about our stay! No complaints!